We deliver superb service as roofing contractors in Paris, KY. Providing roof repair and shingle replacement to all of Bourbon County. Lexington Blue was so great to work with. We had a small leak in our roof (later did we find out that it was from the previous roofing company’s mistake) that was dripping into our living room. We made a call and the very same day they came out to look at our problem. With storms in the forecast they immediately rushed off to grab a tarp and came back that afternoon and put it on to prevent future water from leaking into our house. They didn’t even charge us for the tarping service! It rained over the next couple of days and we never saw a drop! Once the weather finally cleared they came back and provided us an estimate on the spot to repair the leak. They arrived the next morning and by that afternoon it was fixed. We haven’t had any issues since. I appreciate the professionalism and the quality of their work. What Roofing Services do you need in Bourbon County? In general, most of our clients contact us for repairs to their roofs, but we also provide new installations as well. 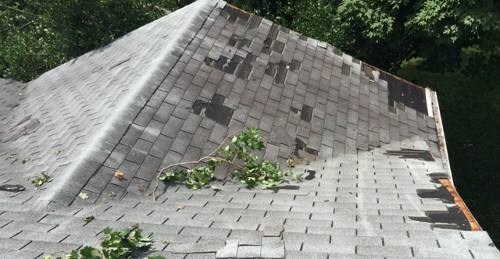 We offer a variety of roofing services such as roof leak repair, emergency tarp covering, color matching for shingles, storm damage replacement and inspections for your roof. No matter what service is required, residents of Bourbon County and Paris trust in us as their roofers of choice. As a roofing company, we have other great services in addition to roofing as well. We can provide gutter replacement, siding installation & repair, window installs and several other home remodeling services. Clients often ask … Can you explain how you will approach my job? We’re always glad to offer any information that helps our future clients decide which roofing contractor they want to hire. The following is an outline of how we approached a recent repair. Shingles missing on roof from wind storms. To provide all materials & labor as awarded by the insurance company. Because the homeowner had this repair cost covered by the insurance claim, we only charged them for the cost of their deductible as required by their policy. Completely tore off old roof down to wood decking. Made improvements by installing a higher quality ice and water shield barrier for better protection. Installed new Owen’s Corning TruDefinition Duration shingles due to their longevity and wind resistance. We completed the full roof replacement and improvements in one day. The homeowner was pleased with the quality of our work and thankful they only had the expense of their deductible. We have always focused our efforts on customer satisfaction. Your opinion of our services, quality and overall experience matters to us. We are dedicated to quality service and workmanship. It won’t take long for you to immediately notice how each of our staff is fully involved in your project. From the first phone call with our office manager, to the initial consultation with our sales team member, the quality control concierge and owner involvement, your experience will be like no other! When you place your trust in us you will guarantee yourself a quality installation backed by bolstered communication, professionalism and peace of mind. With an A+ BBB rating our clients select us as their roofing company in Paris, KY.